Alreay like you on Facebook! My kiddos will love this! thanks for your website! it’s very helpful! Thanks for your weekly WoW gift card giveaways! I LIKE you on Facebook and I LOVE the deals. Thanks! I just “liked” TT on Facebook! Woot! Been a fan of totallytarget for a while. 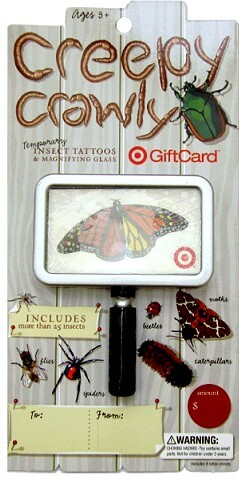 Love it..
My kids would LOVE this card and the tattoos for spring/summer shopping!! Thank you for the chance to win! Fingers crossed! I love target and tt! I like Totally Target and am a FB fan. Love the site, makes my Target shopping that much better! AND already like you on Facebook! Would be really nice to win!! Thanks for the chance. Id LOVE to win!!! THANK YOU!!!! Thanks for all of your help saving green! My kids love bugs. This would be awesome to win! Always “need” something at Target 🙂 Thanks for the chance to win! great giveaway- such a cute gift card! Long-time Facebook and Blog follower! Thanks for the opportunity! awesome gift card! hope to win! I am a fan of Totally Target on Facebook! My boys would love all the creepy insect tattoos. Thanks for the great giveaway! My son would love this! Please pick me! !